A toolbox gets implemented as a custom dialog that uses the toolbox layout manager. All display elements in a container that uses the toolbox layout manager should have the same size. This gets typically done by creating icon buttons for image files that all have the same size. The toolbox layout manager automatically arranges the icons in a grid; and its container's width gets resizable in even incremental steps. The toolbox layout manager automatically repositions its icon according to the new width, automatically adjusting the container's height. A top level window cannot have two or more containers with the toolbox layout manager. This is because the toolbox layout manager computes its elements' width and height and sets its size so that its' adjustable only in even increments, and it's only possible to specify a single sizing increment for a window. The toolbox layout manager normally gets used by itself, in a dialog, with no other containers. This is mostly a formal restriction. toolboxlayoutmanager.C creates a toolbox dialog that gets placed, by default, to the left of its main window. 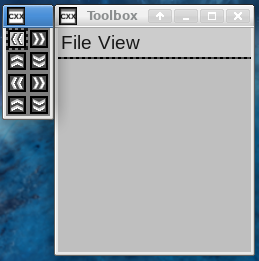 The toolbox dialog contains eight small image icons, a set of default icons from LibCXXW's default theme. The toolbox icons don't do anything, this is for demonstration purposes. Adjusting the toolbox dialog's width rearranges the icons automatically. Closing and rerunning toolboxlayoutmanager.C preserves the main window's and the dialog's position. The “View” menu's “Toolbox” item has an Alt-T keyboard shortcut. This closes and reopens the toolbox dialog. This reopens the toolbox dialog in its default position and size. ** Copyright 2018-2019 Double Precision, Inc.
// The dialog that uses the toolbox layout manager. // View/Toolbox menu item selection callback. // here, this is toolbox_visible()'s job. // matter how the toolbox got opened or closed. // "Toolbox" item. Update its selection status accordingly. // The creator for the toolbox dialog. // Initialize the contents of the toolbox container. // The toolbox icons are really radio buttons. We'll create 8 of them. // Each icon is two images: clicked and unclicked. // modify() the default radio button theme. // a copy of the theme object. // no focus with one that's visually visible. // console, when the radio button gets selected. // Ignore the initial callback invocation. // Creator for the main window. // Create a canvas element, to give the window some size. // The layout manager for the new toolbox. // Default number of columns is 2. This is the default value. // Creating a dialog with this unique identifier. // Initial position of this dialog is to the left of the main window. // But if we saved the previous dialog position, load it. // The new dialog's layout manager is th etoolbox layout manager. // probably ignore this, but we'll go ahead and do this. // action be to close the dialog. // "File" menu, with just a "Quit" option. // The "View" menu with the "Toolbox" option. // are stable, show the dialog immediately afterwards. // used position on the screen. Passing a x::w::new_toolboxlayoutmanager as a 2nd parameter to create_container() creates a new container that uses the x::w::toolboxlayoutmanager; but the toolbox layout manager usually gets used as a layout manager for a dialog. This is done by creating a custom dialog with create_dialog(), and setting dialog_layout in the x::w::create_dialog_args parameter. This creates a new dialog that uses the toolbox layout manager instead of the default grid layout manager.